WASHINGTON (Sputnik) - The United States likely persuaded Israel into doctoring and framing intelligence Iraq War-style in a bid to undermine the Iran nuclear accord and pave the road for a US invasion, analysts told Sputnik. On Thursday, Russian Foreign Minister Sergey Lavrov called on Israel to immediately hand over intelligence to the International Atomic Energy Agency (IAEA) related to Iran continuing its nuclear program and violating the Joint Comprehensive Plan of Action (JCPOA). The alleged intelligence was referenced by Israeli Prime Minister Benjamin Netanyahu during an internationally-televised address earlier this week. US President Donald Trump, who has repeatedly described the JCPOA as the worst deal in history, faces a May 12 deadline to decide whether or not the United States will remain a party to the agreement. Some expect Trump to exit the deal, however, Secretary of State Mike Pompeo admitted during his confirmation hearing that Iran was living up to its commitments under the agreement. 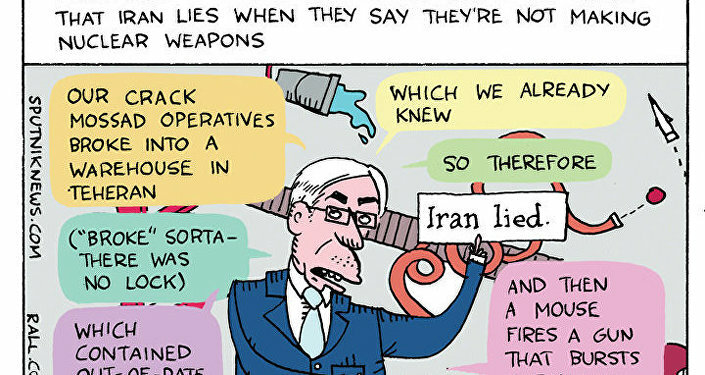 Critics said the actual information highlighted by Netanyahu only proved a widely known fact — that Tehran had an active nuclear weapons program before the JCPOA was reached in Vienna on July 14, 2015. The White House, however, said in a statement later on Monday that the United States supported Israel’s efforts and called the details gathered by Israeli intelligence compelling, which seemed to lend credence to Netanyahu’s allegations. The open question, according to experts, was whether Israel was simply aligning the intelligence with policy that is made within Washington, DC’s so-called "Beltway" — the nickname given to the expressway that encircles the most critical US government organs, including Congress and the White House. "If the events leading up to the invasion of Iraq are any indicator, intelligence and facts tend to be fixed around Beltway policy," author and intelligence collection analyst William Blunden told Sputnik. Not to mention, Blunden argued, Israel is largely a US "client state" with a long history of acting on behalf of American interests. "Hence, Netanyahu's dog and pony show is far more likely a response to the White House stance towards Iran rather than vice-versa," he said. Foreign Policy advocacy group director Robert Naiman told Sputnik that Netanyahu’s comments appeared designed to serve the Trump administration’s desire to pull out of the JCPOA and put increased pressure on major European nations to abandon it as well. "My own sense is that what the Trump administration wants out of this is to pressure the Europeans to help them be more aggressive against Iran in Syria and Yemen. Whether they will get something out of that they see sufficient as a justification for backing down is hard to guess," he said. Naiman also agreed that Netanyahu had failed to present any new data whatsoever that could be used to justify the US government or another signatory pulling out of or reassessing the 2015 agreement. "I would expect no impact. There was no new information, and everyone who cares to know that there was no new information knows that there was no new information," he said. Everything that the Israeli Prime Minister talked about in his presentation concerned events before the Iran nuclear deal went into effect, Naiman pointed out. "The Trump administration could try to use the Israeli Prime Minister's presentation as an excuse to withdraw from the deal, but it would only be an excuse," he said. "Even Secretary Pompeo admitted in his confirmation hearing that Iran was complying with the deal." The JCPOA was reached between Iran and the five permanent members of the UN Security Council — Russia, the United States, China, France and the United Kingdom — plus Germany and the European Union. The pact relaxes sanctions on Iran in exchange for Tehran allowing inspectors to ensure the nature of the program is peaceful.